KITS Online Training Institute is one of the best training institute in leading IT online training. We provide best SAP BW on Hana online training with our highly professional real time trainers. 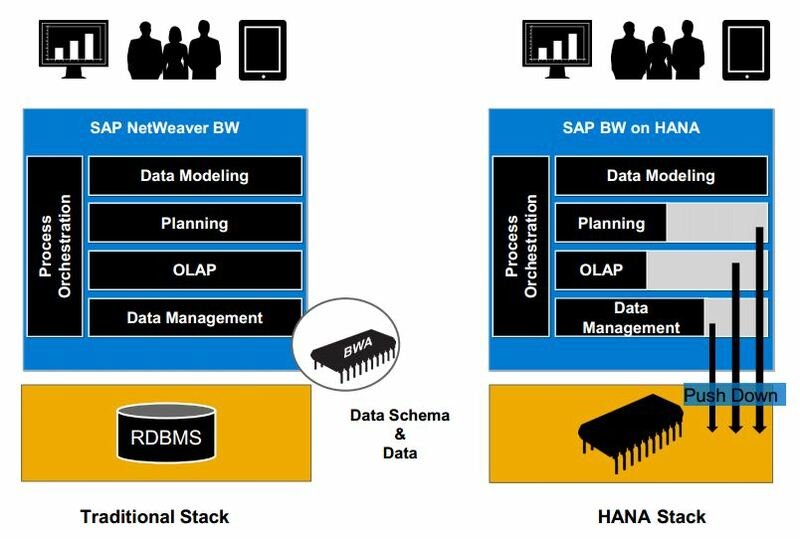 SAP BW on HANA is the next wave of SAP’s in-memory technology vision that enables SAP NetWeaver BW to use SAP Hana as a fully functioning in-memory database. Running SAP BW on Hana results in dramatically improved performance, simplified administration and streamlined IT landscape resulting in lowering total cost of ownership. KITS also do corporate training and help them to train their employees. We also provide other related courses. * Very in depth course material with Real Time Scenarios for each topic with its Solutions for SAP BW HANA Online Trainings. * We Also provide Case studies for SAP BW HANA Online Training. * We also provide Normal Track, Fast Track and Weekend Batches also for SAP BW HANA Online Training. SAP BW on HANA is nothing but SAP’s existing NetWeaver BW data warehouse, running on SAP HANA. SAP now supports SAP HANA as the underlying database for the NetWeaver BW Data Warehouse. Because SAP HANA is much faster than regular relational databases like Oracle or Microsoft SQL Server, the data warehouse performs much faster. 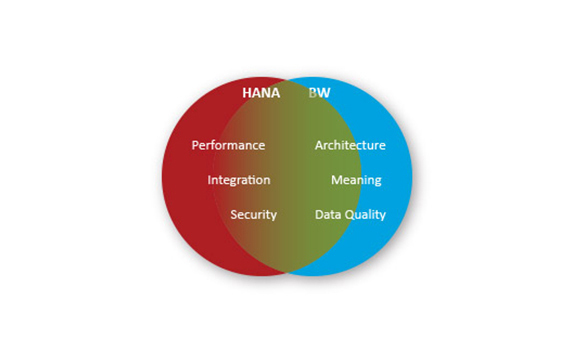 The purpose of SAP BW on HANA is to combine the power of both. What are the drawbacks of SAP BW on a RDBMS like Oracle? Any change in structure or report takes too much time. Normally it takes 3-12 months to get a change in structure or report. It lacks the granular level details. In SAP BW data is aggregated and materialized so users can’t get the way they need or at the granularity they require. Every report has to be tuned for acceptable performance. Real time data are not available for analysis. Data is moved to SAP BW in batches and takes time. 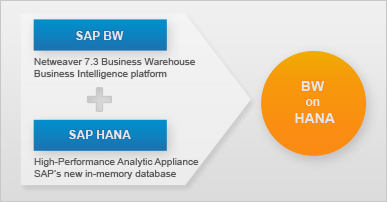 SAP BW on HANA is smarter, simpler and more efficient. In today’s business world, fast access and manipulation is required on top of massive data stores. This is beyond the capabilities of traditional disk-based systems. SAP HANA helps your SAP NetWeaver Business Warehouse run better than ever. HANA enables you to analyze large amounts of data, from virtually any source, in near real time, making it possible to access reports with up-to-the-minute information. As an example, having the most current order and logistics information makes it possible to manage your inventory more efficiently, and to predict Available to Promise (ATP) more accurately. When you take into account the cost of hardware, software licenses, maintenance, performance tuning and project development, SAP BW is always cheaper in terms of TCO when running on HANA. Whether HANA also is cheaper in terms of Total Cost of Acquisition (TCA) depends on where you are in your procurement lifecycle. Do you have to replace hardware anyhow? Can you free up resources on expensive UNIX equipment? Can you reuse the Oracle or DB2 licenses elsewhere or save on maintenance revenue? Do you have to complete a SAP system upgrade as well? Do you save substantially on storage costs? Many times, the answer is yes! Non-disruptive innovation and advanced administrative tools. The current business processes inside BW can stay as they are and will mesh perfectly with HANA. System operation stays as it is, and process chains do not need to be remodeled. With HANA there is no need to retrain end users familiar with BW. There is still the same BW application process but, with BW on SAP HANA, it is now possible to run queries, updates and reports much faster than before. Expert users do not need to get retrained because they can continue to use their current BI or other frontend tools. In addition, HANA supports the BW Analysis Authorization Concept, and can be integrated with NetWeaver Identity Management to ensure security remains intact. What Are The Prerequisites To Learn SAP BW on Hana? 1. Candidates should have basic knowledge of data warehousing concepts along with excellent business knowledge on different application areas. 2. Experience in the ABAP language will be an added advantage. If you would like to take the online demo for sap bw on hana trainer can you please make an inquiry or fill the form for demo registration, one of our executives will arrange a meeting with the expert trainer. SAP BW On Hana Online Training, SAP BW On Hana Training, SAP BW On Hana Training Tutorial, SAP BW On Hana Interview Questions, SAP BW On Hana Online Training From India, SAP BW On Hana Online Training In USA, SAP BW On Hana Training Online Free, SAP BW On Hana Course Certification, SAP BW On Hana Training Course, SAP BW On Hana Job Oriented Training, SAP BW On Hana Course, Live SAP BW On Hana Online Training, SAP BW On Hana Training From India, SAP BW On Hana Online Training From Hyderabad, SAP BW On Hana Course Content, SAP BW On Hana training videos, SAP BW On Hana Course In Chennai, SAP BW On Hana Course Pdf, SAP BW On Hana Training Institute, SAP BW On Hana training Material.